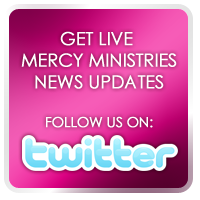 Mercy Ministries News: Cornerstone Toledo Youth Visit Mercy Ministries Today!!! Cornerstone Toledo Youth Visit Mercy Ministries Today!!! We had such a great time today hosting a group of 25 girls and guys from the youth group at Cornerstone Church in Toledo, OH pastored by Bishop Michael Pitts and his beautiful wife, Kathi. It was extra special today to host this very special group of youth leaders because of the relationship we have with this church. Not only have they provided financial support for Mercy Ministries, but our Founder and President, Nancy Alcorn has also had the privilege of speaking at their women’s conference and visiting the church over the years. The 25 Toledo visitors were hosted today by Merri Duff, one of our Mercy youth volunteers who is a local college student at Trevecca University here in Nashville. Merri was actually born to a Mercy birthmother in 1991 and placed for adoption through our adoption agency. That is why it was so special to have her host this awesome group of youth leaders from Cornerstone. All of these lives intersect for the next three days, as they are in town to participate in CeCe Winans “Always Sisters, Forever Brothers” conference beginning tonight and continuing through Saturday night. This conference features nationally known music artists, along with internationally known speakers. The kick-off for the conference begins at 9:00 PM tonight at the Curb Center on Belmont University’s campus. If you are reading this and want to be a part of it, you can show up and register at the door. Not only are the youth from Toledo a part of this conference, but the girls and staff from Mercy Ministries' Nashville home will be attending as well. Nancy Alcorn was honored to once again be asked to participate in the conference, not only as a speaker, but also as one of the sponsors for the event. It has been our great joy to be a part of this conference every year, and it is always so amazing to see the way God moves in power to bring impact to the lives of those in attendance. Please say a prayer for this very special conference, that it will be life altering and that the ripple effect will be felt throughout the entire nation and beyond.